3D view of the Attosecond Beamline SE1. From left to right: optical setup, high harmonic generation chamber, differential pumping, XUV spectrometer chamber, magnetic bottle spectrometer, refocusing chamber, and COLTRIMS apparatus from ISMO. The ATTOphysics Group is the Coordinator of the brand new national facility ATTOLab. Initiated by an Equipment of Excellence (Equipex) program of the National Research Agency (ANR), it gathers nine laboratories representing eight institutions. ATTOLab provides an experimental platform for interdisciplinary studies of ultra-fast dynamics - electronic and nuclear dynamics at femtosecond (10-15) and attosecond (10-18) timescales – in systems in the gas, condensed and plasma phases. One attosecond beamline (SE1), is driven by the FAB1 laser (1 kHz, 15 mJ, 24 fs, CEP). The high laser energy allows multiple-beam designs as well as spatio-temporal/spectral shaping (e.g. frequency conversion using an OPA) for a versatile and flexible attosecond beamline. 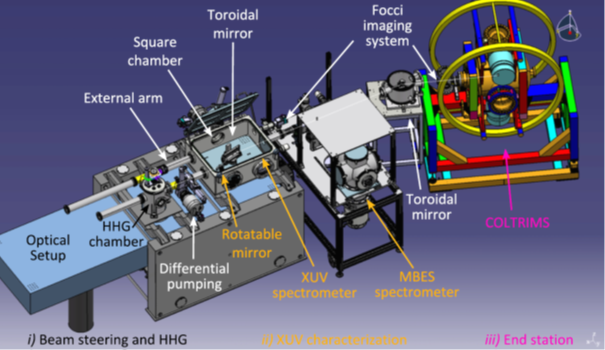 S. Weber et al, Flexible attosecond beamline for high harmonic spectroscopy and XUV/near-IR pump probe experiments requiring long acquisition times, Review of Scientific Instruments 86, 033108 (2015).